Banana boats and other activities provide a great fun way of getting wet on holiday when the water is invitingly warm and clear blue and the concern is less about falling into sea than not doing. A banana boat is an unpowered inflatable craft that is designed to be ridden by several people and is pulled along the water by a motorised boat. Riders sit astride a large inflatable tube, with two smaller tubes on either side providing balance and footrests. Although banana boats are popular with all sorts of water users, with many luxury yachts having them as onboard toys, they are largely associated with lively groups of holidaymakers in the more sun kissed parts of the globe. Banana boats usually seat between and three and ten passengers, although there are twin models available where two groups sit parallel to one another. Often the boats are coloured yellow to resemble their namesake fruit, and sometimes they are even moulded into a banana shape. Although in the film Jaws the Revenge banana boaters were seen being attacked by a shark, this is far from a typical scene, and they are in fact one of the safer watersports available. 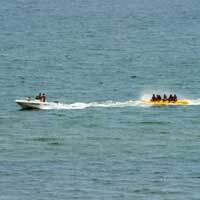 Banana boats allow its riders to experience the thrill of speeding across the water in close proximity to the surface without any of the difficulties and dangers associated with surfing or water-skiing. Nevertheless despite claims they are so safe children can join in, banana boats do attract their fair share of injuries. This is hardly surprising as the experience is much like rodeo bull riding with the riders trying desperately to cling on to the banana whilst being flung about. Common injuries include facial cuts and bruising. Also the stress of holding on, being thrown off and then climbing back on puts a lot of pressure on the muscles and can prove quite painful the following morning, if not worse. Smaller children and the elderly are therefore strongly warned against taking a ride. Riders are subject to sudden stops and accelerations and often end up spending as much time in the water as they do on the banana. Needless to say all participants should be kitted out with lifejackets, although those who are not confident spending time in the sea water and not able swimmers are probably best advised to stick to a more sedate vessel. Flying fish is another popular holiday activity and can be best described as like a cross between banana boating and parasailing, albeit one more hair-raising than both. Typically two people sit on either side of the fish, with one in the middle, and then cling on for dear life as it is pulled along by a motor boat. As the speed increases its aerodynamic design allows it to rise up into the air. Like banana boating it is not activity for small children or the old and fragile because its main appeal is in being thrown about and getting very wet, with the added fear factor of being airborne. As a general rule the flying fish are safer the greater the stabilising human weight on their back. Besides swimming gear and a lifejacket, the other essential for holiday watersports people is sun protection. Sunscreen with UVA and UVB protection should be applied before entering the water and reapplied upon leaving it. UVB rays cause sunburn whereas UVA is the radiation responsible for the skin aging process. Who regulates banana boating and similar activities in the UK?